The next two dishes of Vung Tau I would like to introduce are Grilled Octopus and Squab Porridge. They are well known as Vietnamese Street Food. You may see on these two dishes are sold widely in Vung Tau, especially Thuy Van Street. 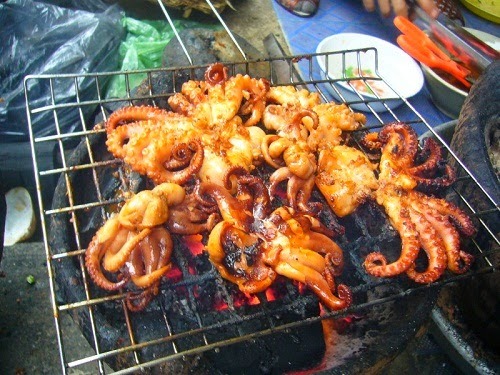 The first one I want to introduce is Grilled Octopus (Bạch Tuộc Nướng). From the early morning to late night, there are hundreds of street vendors and motorbike shop selling this Vietnamese Street Food. The coals there are always hot and attractive flavor is spreading out the streets. It makes the walkers cannot keep walking; they have to stop their step and turn to one shop immediately. In my opinion, the best time and best place for enjoying this Vietnamese Street Food is on the beach and after you take the bath on the beach. It is so fantastic to eat one hot dish and drink one cool bottle of beer after taking bath. I suggest you one tip when choosing octopus that you have to choose the fresh and big one and wait until the sellers grill it completely. The next dish is Squab Porridge (Cháo Bồ Câu). 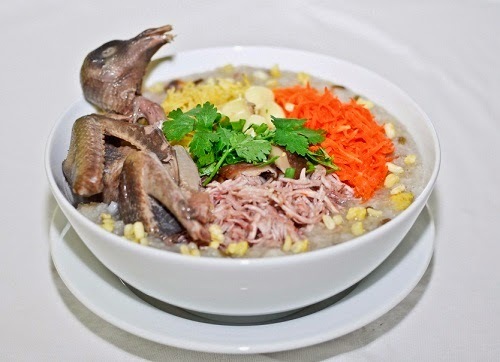 Squab Porridge is nutrient food for the health of eaters. This Vietnamese Street Food is really enjoyed by the visitors, especially the expat. Đồ Chiểu Street is the street where shop vendors and restaurants sell mostly this dish. Some people suggested that the best shop vendors selling this food are located on the corner of Đồ Chiểu Street. Besides of squab porridge, there are some dishes are made from squab that also attract the tourists such as grilled squab, fried squab. In some country, squab is a kind of bird that cannot be hunted and ate, however you can eat it freely in Vietnam. Vũng Tàu also has many scrumptious foods that you need to explore by yourself. Hope you can share them with us and do not miss our final post about this topic tomorrow.